Published on 18. 06. 2013 in commentary and criticism and pictorial arts. 1 Comment Tags: Christie's, Titian. Another possible Titian is coming to the block. The picture at right will be auctioned at Christie’s, London on 2 July. It’s clearly a fragment of a picture that was once bigger, most likely a half-length portrait. Is it a Titian? 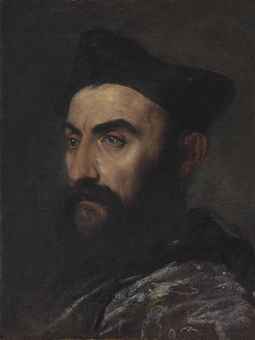 Christie’s seems cautious, having set the estimate at only £400,000 – £600,000 (low for a genuine Titian), while the experts they have consulted all agree on the attribution. While fairly obscure, the picture is not unknown in the literature. In addition to Berenson as cited in the entry, it was included in Fischl’s and Suida’s monographs on the artist (1904 and 1933, respectively), both of whom saw in it Titian’s hand. And my former supervisor Paul Joannides published it in Studi Tizianeschi in 2006. He agrees with the attribution, dating it around 1560, although he points out that the suggestion of the shoulder at lower right is a later edition, making it appear more like a complete portrait. My colleague Chris Fischer recently saw the picture and is less convinced, describing it as dry and somewhat dull in execution, lacking the depth Titian brings to his renditions of flesh especially. Judging only from the reproduction, I think it looks pretty great and have no problem accepting the attribution with the natural caution that I would reserve the privilege to change my mind were I to see it in the flesh. Update 30 June 2013: I have now seen the painting, and it seems to me convincing as a Titian. I’m unsure about the shoulder, which Joannides as mentioned has proposed is a later addition: it is very loosely painted and does not quite cohere with the head, which seems only tenuously attached to it. It may have made more sense before the canvas was cut, however. The canvas is of the herringbone weave type, which was spun in large sections, another indication that the painting must have been considerably bigger originally. Although most likely conceived as a half-length portrait, one cannot rule out that the present picture was cut from a larger, multi-figure composition. The head is marvellously animated, painted in thick, confident strokes, with wonderful detailing around the left eye and temple, and pentimenti around the ear. Although fairly broadly executed, the overall impression of the face and especially the flesh parts is of the kind of tightness one sees in Titian’s work of the 1540s and 1550s, rather than the deeper glow and more dissolute contouring of his work in the late 1550s through the 1560s. This is a very fine and highly imprecise distinction, however, and I would be loath to fix a date for it. In aspects it reminds me most of such pictures as the National Gallery Vendramin Family Portrait, which was largely painted in the early 1540s, but at the same time it is sufficiently broad in parts that it could easily be of the following decade. It fetched a little under 800 k. The amazing Ribera a little less than that. The great Rubens went above the 1 million mark.